People always ask me how you manage to arrange your time and schedule to keep up with posting contend on the blog. Well here is my secret… You may have seen already that on the blog toolbar at the sides there is a logo saying Independent Fashion Bloggers this logo represents one of my main blogging communities of fashion, beauty, and accessories. It’s the world to promote your work whilst keeping in touch with your bloggerlettes and some of your favourite blog’s. On the other hand it’s a fabulous way of getting help to reach your blogging goals. One of my blogging goals is to arrange my timings with my day to day schedule. This is one of my favourite tools of my bloggers toolkit. 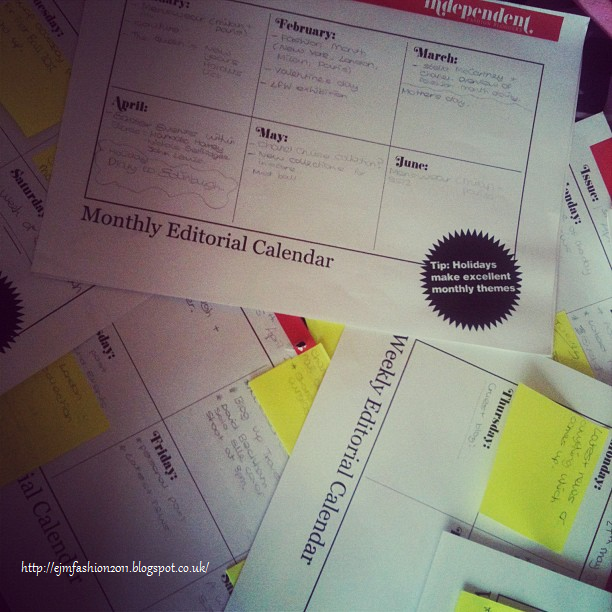 This document is the Independent Fashion Blogger Editorial Calendar. This wonderful document helps me plan and organize what I’m featuring each week along with keeping inspired whilst juggling my busy lifestyle... It’s handy to break each post for a weekly overview on your blog down with this because, one day you will have one latest news to another you may have your midweek treat, personal post from your self, or a guest feature. For a monthly overview this tool allows you to create monthly themes such as for Me January is Menswear, February is fashion month, May is Cruise collections, and August is that month of a holiday etc you get the picture. It’s just there for me to go ahead of my blogging goals, write interesting updates for my readers, along with them getting an insight to my own personality. Also it makes blogging more enjoyable because, like myself I can use my contacts to produce guest features etc... So you are being sociable at the same time. Why not try this tool when your arranging for own posts? Happy Blogging and hope to come across you through IFB.